It’s a perception problem. One in which you’ve mostly stumbled into as you’ve been busy growing your businesses. Hey, I get it. I was in the same place early in my career. Perhaps like you, I didn’t start in this industry because I was wild about being a business owner and wearing an entrepreneur hat. I liked plants. And, I figured I could work outside all day and get a sweet tan. Marketing? Selling?? Not my thing. Thankfully I’ve evolved somewhat (the sweet tan turned into a sore back). Now after 20-plus years in the lawn and landscape industry and working with dozens and dozens of companies as a consultant and marketing agency founder, I can share four of the most common patterns I’ve observed which lead to my not-so-subtle Just Another Landscaper moniker. The Pattern: Fancy trucks and equipment… but lousy branding. Great work… but not profitable. 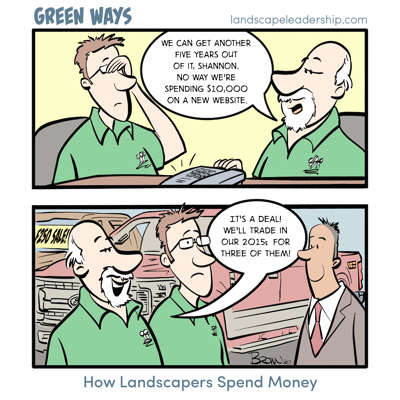 Operations (i.e.- producing the work) is just one aspect of running a successful, profitable landscaping business. For some of you, unfortunately, it seems to be the only thing. I’ve stopped counting the number of companies I’ve seen with beautiful trucks and equipment in their yard yet a hot mess for a website that serves as the first touch and virtual front door for many potential customers. Or companies who manage to do beautiful work yet fail to earn a decent profit. The most successful companies I know excel on more fronts other than production, be that financial management and pricing, branding and marketing, or selling. Being efficient and producing good work – or even great work – only gets you so far. The Pattern: Jack of all trades… master of none. Mrs. Homeowner asks you to fertilize her lawn. Now you’re a lawn care company. Might as well buy a mower now, right? Her neighbor asks you to clean his gutters and power wash his deck… And on and on it goes. Because you won’t say no. 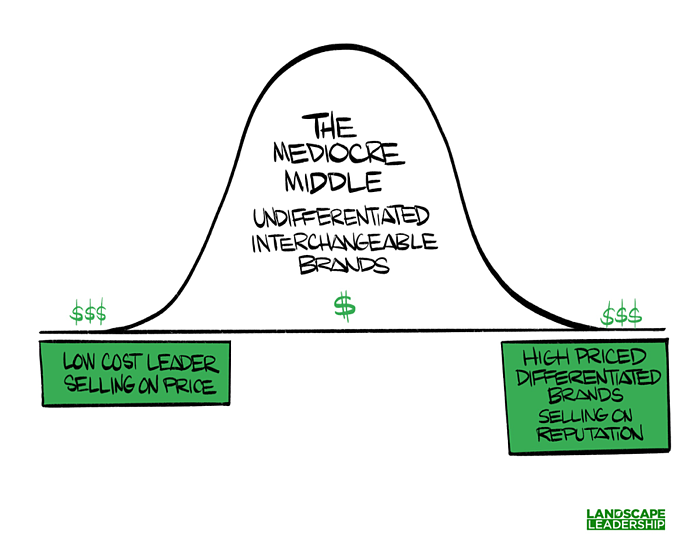 The most successful companies (i.e.- profitable) offer less, not more. 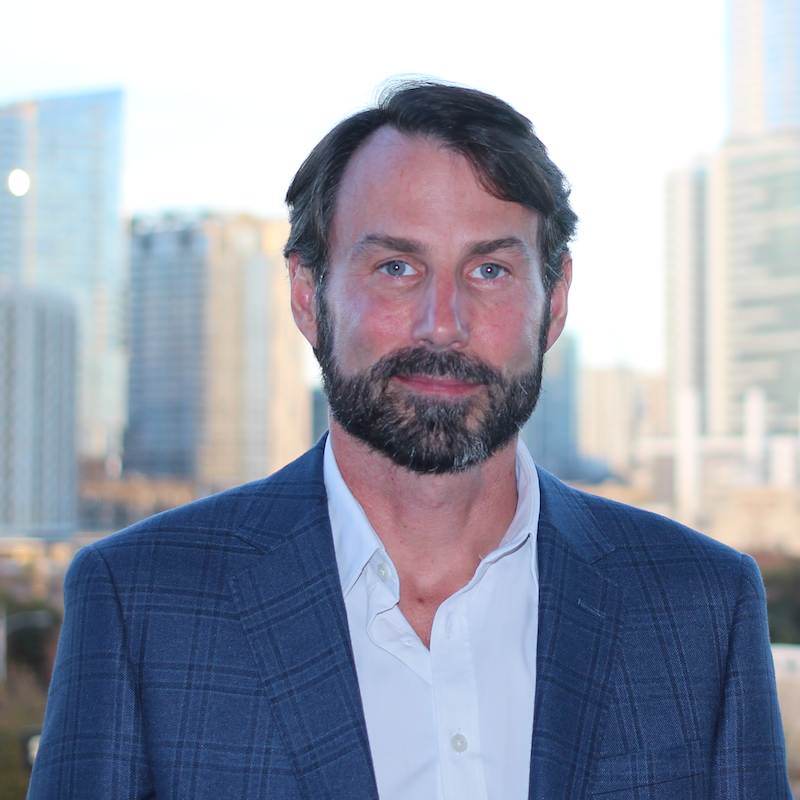 The Pattern: Revenue growth is the goal… profitability is an afterthought. Having drinks with a table full of landscape contractors takes me back to the high school locker room where teenage boys regularly “sized” each other up, if you know what I mean. Only today it’s comparing number of employees and vehicles and how much revenue your company does each year. The industry’s default growth-at-all-cost mentality is why so many complain about below average profit margins and severe labor shortages. Most of you don’t need to hire more employees– you need to raise your prices and fire half your clients. The Pattern: You focus on being “better”… instead of being different. You’re all too much alike. Trust me on this point– I’ve talked with thousands of you. You have virtually identical business models, which includes how you market, price, and sell your services. You target the exact same customers. You use the same language in all your marketing and messaging; similar in both style (boring) and substance (hyperbole). Just look at your website and your competitors if you don’t think this is true. Let’s finish by talking about that no-man’s land where most of you find yourselves today. The world’s most successful companies and brands reside on the outer edges of the bell curve. This is where the money is. The commercial airline industry serves as a great example. Southwest Airlines, the perceived low fare provider, is consistently one of the most profitable domestic airlines, while Virgin Atlantic resides on the opposite end of the spectrum, pulling in profits based on reputation, exclusivity, and luxury as opposed to low price. You know what airlines make up the mediocre middle: Delta Air Lines, United Airlines, and American Airlines. In my mind these three carriers are all the same. Absolutely nothing distinguishes one from the others. It should come as no surprise that these companies rank in the middle of the pack when it comes to profitability. If you are Just Another Landscaper, you’re living in the middle with all the other companies lacking a unique and compelling identity. You’ve got nothing to hang your hat on, which should be a scary thought when you consider the ups and downs of the economy. Right now, with a strong economy, this mediocre middle is getting fat with lots of companies feeling really comfortable. What will happen to this bell curve with another dramatic downturn in the economy? Guess who will get squeezed? Hint: It won’t be the companies on the edges of the bell curve. I don’t want you to get squeezed. I don’t want you to be Just Another Landscaper. I want you to distinguish yourself from your competitors, and in doing so, reap the rewards in the form of greater profits. You know, put more money in your personal bank account. We can help. Let’s work together to break from these common patterns and create a brand positioning strategy for your company that will allow you to truly stand out in your market. Step one is our Total Marketing Review. Schedule a meeting with us to learn if we’re a good fit for each other. Not ready yet? Make sure you are subscribed to our blog so you receive our candid insight like this when we publish new articles. You can subscribe here or just add your email address in the form below.